The annual Lassen County Fair races wrapped up the 2018 Diamond Mountain Speedway season with a ribbon of excitement, action and drama July 22. 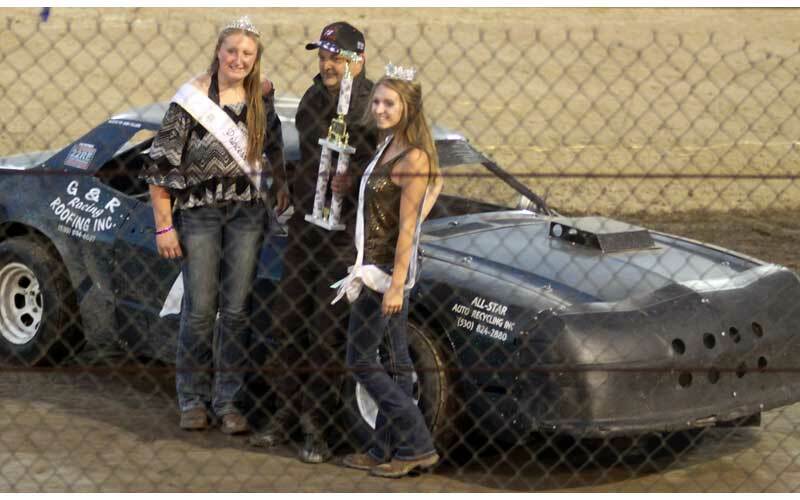 Additionally, the races were followed with the final event of the fair, the demolition derby. 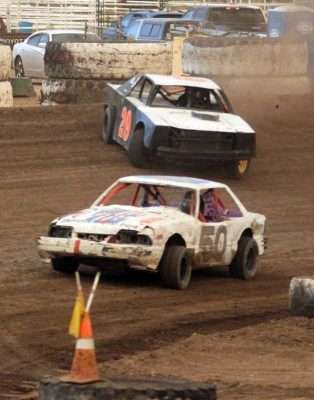 The fair races saw the grandstands packed full of dedicated fans eager to feel the vibrations of stockcars, mini stock, modified and sports modified cars zooming around the track. And with lighting and a pleasant breeze in the background, it was the perfect evening for many fans. However, the same couldn’t be said for all racers. 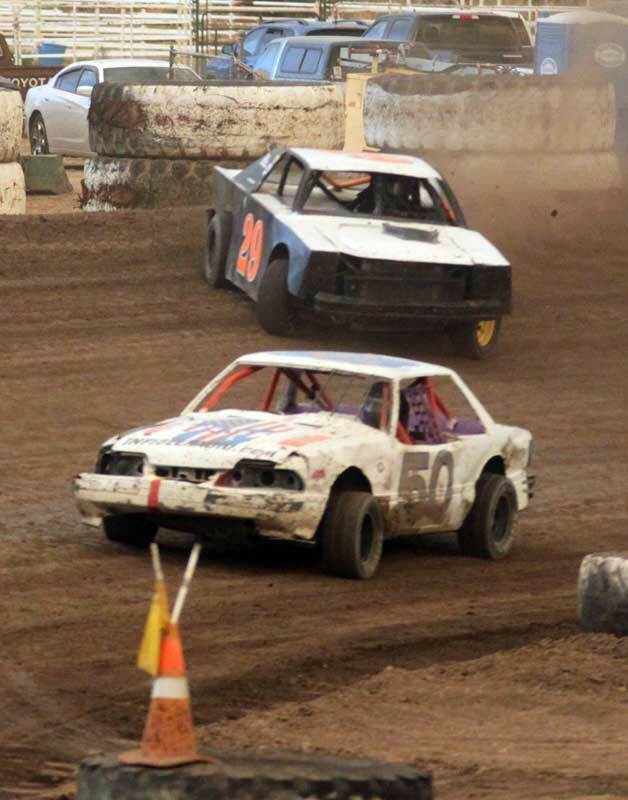 During the mini stock race, multiple spinouts were seen and one car managed to lose a tire during all the fuss. 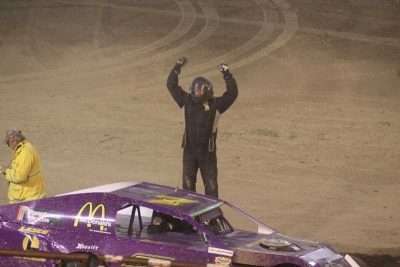 The stockcar division also saw some dust raised as vehicles had trouble staying on the track. In the first lap of the modified race, a six-car collision put everything on hold at the second turn. Although a tow truck was brought on the track, its services were not needed just yet. 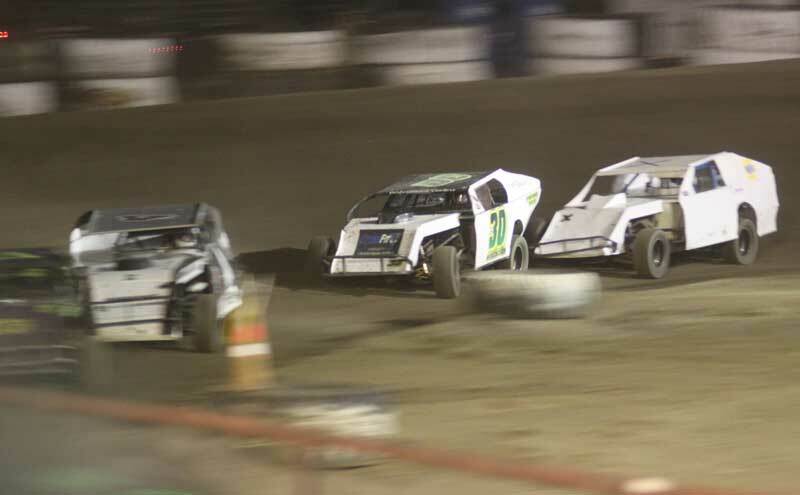 The drama escalated during the modified race as a collision later on did require the services of the tow truck and one hot-blooded driver stole the show by exiting his vehicle. off his harness and began marching toward the collision site. Though there were many speculations as to what sparked McCracken’s fury, no official reasoning has been confirmed. McCracken did not reach the collision sight, however, as personnel deterred him from his course and ultimately calmed the situation. 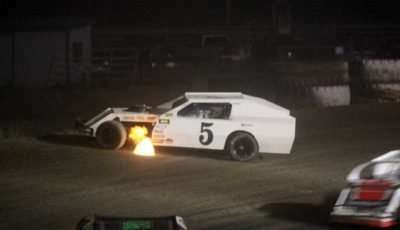 The race was unable to begin again until the compromised vehicle and driver Rob Robles were towed from the track. The final laps of the modified race kept fans on their toes and ultimately ended with a bang as racer Dustin Sell spewed off a few flames from his vehicle as it neared the edge of the track, but with steady hands and a calm attitude, Sell managed to get back in the race and finish strong. The final race of the evening was sports modified, which started and ended with relative ease, much to the surprise of those witness to the drama that spouted from the previous race. 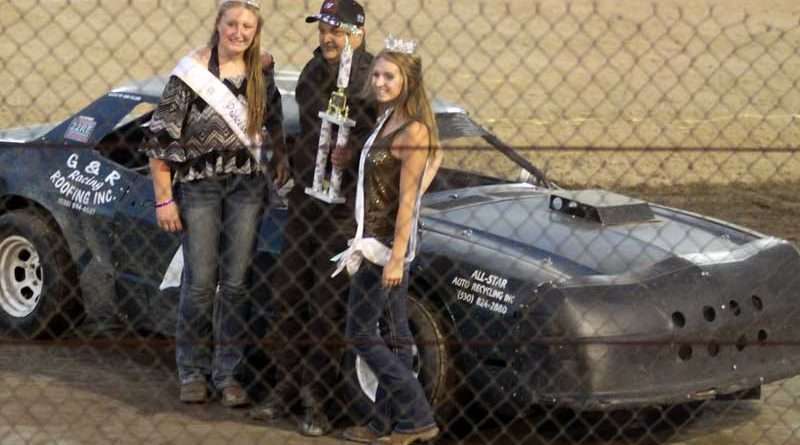 Additionally, Lassen County Fair Manager Jim Wolcott announced that, “due to circumstances beyond our control,” the final three races of the season will not take place. 1. Tom Davis, No. 75, 3 points; 2. Bion Barr, No. 03, 2 points; 3. Cody Kennemore, No. 5.0, 1 point. 1. Katelynn Robertson, No. 7, 5 points; 2. Colton Lawson, No. 32, 4 points; 3. Wyatt Spalding, No. 25, 3 points; 4. Johnny Moya, No. 74, 2 points; 5. Anthony Hovland, No. 18x, 1 point. 1. Davis, 40 points; 2. Lawson, 39 points; 3. Cody Kennemore, 38 points; 4. Barr, 37 points; 5. Katelynn Robertson, 36 points; 6. Taylor Micone, No. 29, 35 points; 7. Spalding, 34 points; 8. Moya, 33 points; 9. Hovland, 32 points. 10. Ryan Belli, No. 63, 31 points. 1. Shayna Robertson, No. 7n, 5 points; 2. Jimmy Huffmon, No. 27, 4 points; 3. Colby Russell, No. 42, 3 points; 4. Kimberly Plake, No. 17x, 2 points; 5. Fred Kresge, No. 3, 1 point. 1. Huffmon, 35 points; 2. Shayna Roberton, 34 points; 3. Russell, 33 points; 4. Kresge, 32 points; 5. Plake, 31 points. 1. Mitch Murphy, No. 6m, 6 points; 2. Larry McCracken, No. 06, 5 points; 3. Steve Boucher, No. 177, 4 points; 4. Tyler Patske, No. 9p, 3 points; 5. Boyd Murchison, No. 30, 2 points; 6. Jeff Chew, No. 8x, 1 point. 1. Chris Olexiewicz, No. 88c, 6 points; 2. Scott Foreman, No. 4f, 5 points; 3. Chris Nieman, No. 3, 4 points; 4. Rob Robles, No. 17r, 3 points; 5. Galen Plake, No. 13, 2 points; 6. Galen Hainline, No. 11g, 1 point. 1. Cory Sample, No. 00, 6 points; 2. Wade Kennemore, No. 24k; 3. Shane Devolder, No. 44s, 4 points; 4. Matt Murphy, No. 7m, 3 points; 5. Mike Kraft, No. x, 2 points; 6. Dustin Sell, No. 5, 1 point. 1. Matt Murphy, 40 points; 2. Devolder, 39 points; 3. Mitch Murphy, 38 points; 4. Sample, 37 points; 5. McCracken, 36 points; 6. Foreman, 35 points; 7. Wade Kennemore, 34 points; 8. Hainline, 33 points; 9. Murchison, 32 points. 10. Plake, 31 points; 11. Chris Nieman, 30 points; 12. Olexiewics, 29 points; 13. Sell, 28 points; 14. Boucher, 27 points. 1. Jimmy Ford, No. 79, 6 points; 2. Craig Nieman, No. 7n, 5 points; 3. Richard Longacre, No. 07, 4 points; 4. James Lipke, No. 4y, 3 points; 5. Nathan Howard, No. 81, 2 points; 6. Jason Emmot, No. 9, 1 point. 1. Nieman, 36 points; 2. Longacre, 35 points; 3. Ford, 34 points; 4. Howard, 33 points.